What is is about Southampton, cruise ship events, and good weather? The three are never seen together. Take, for example, last year’s celebrations from both Cunard and P&O. Cunard arranged for a three-Queen event on Jubilee Day; it poured down: the Red Arrows display didn’t happen, and the fireworks were a bit of a damp squib. That was in June. Then P&O had their Grand Event in July – it was their 175th birthday – with the whole P&O fleet. Years of planning and preparation went into this, mainly to shoe-horn seven ships into a port that can take just four comfortably and five at a pinch; but also to arrange for HRH The Princess Royal to attend, plus associated celebratory events by the Red Arrows (didn’t happen), the Battle of Britain flight (ditto) and fireworks (damp squib time again). I took pictures of this one so you can see what I’m talking about. And in previous years there were the arrivals of Independence of the Seas, Ventura and Arcadia, all to the accompaniment of torrential rain or even snow. I thought the duck was about to be broken, however, when I saw the weather forecast for today, the day when Royal Princess arrived in Southampton: loads of sun and bags of frizzle! Yes! But this morning when I opened my hotel bedroom window all I could hear was – rain. “It’ll be nice this afternoon” the local weather person said on the TV. “Too late!” I grumbled back. But was I going to let a little rain put me off? 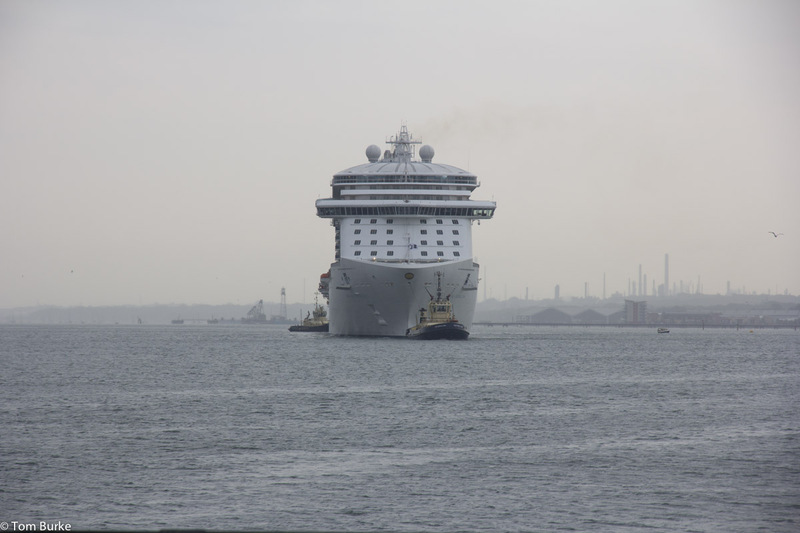 Definitely not – I had come to Southampton to get pictures of Royal Princess, and get these pictures I would. Mind you, a certain amount of re-planning had to be done. I had intended to take an early fast-cat over to Cowes and photograph her as she entered the turns round Bramble Bank – I had visions of the sunlight coming in from the SE over my right shoulder and illuminating the ship very nicely – and then getting a fast-cat back into Southampton, overtaking her on the way and thus being back at Town Quay when she did her parade up and down the harbour. I also realised that I hadn’t brought any waterproofs. So I drove down to Stokes Bay on the mainland side of the Solent instead and took pictures from there, hopping in and out of the car; then I drove back into Southampton, walked down to Town Quay, and tried to take pictures from there. The weather was atrocious. Hard rain at times, plus thunder and lightning. Very dead, dull light; very little to work with. I’ve post-processed these images a bit, but in reality it was all a lot murkier than they appear. So what do I think of her? Well, I’m not sure. I think she’s one deck too high to look really elegant – she just looks a bit top-heavy, as some other big ships do. Norwegian Breakaway come to mind, for example. The Solstice class look a lot better, I can’t help thinking, but I also think that they have one deck less and thus the superstructure is that much less massive and heavy-looking. That said, I’m sure she hits her design requirements right on the nail and that cruises in her will be most enjoyable. So that was it: Southampton, rain, thunder, lightning, and Royal Princess. Who could ask for more?